WASHINGTON — A Republican member of Congress and close ally of President Donald Trump accused Michael Cohen of infidelity on Tuesday, raising questions about witness intimidation as Trump’s former personal attorney and fixer testifies before Congress this week. Florida Rep. Matt Gaetz, a Trump loyalist who has spearheaded efforts to undermine the investigations into Russian election interference, went on Twitter to accuse Cohen, without evidence, of having an extramarital affair. Gaetz sent the tweet as Cohen was nearing his seventh hour of testimony behind closed doors to the Senate Intelligence Committee, which is leading the congressional Russia investigations, and the day before he is slated to testify in public before the House Oversight Committee. Cohen, who pleaded guilty last year to lying to the Senate Intelligence Committee in 2017 about negotiations to build a Trump Tower in Moscow during the presidential campaign, is now cooperating with special counsel Robert Mueller’s Russia investigation and has pledged to tell Congress the truth in a series of hearings this week. Reports Tuesday suggested Cohen was telling investigators about his previous lies to them. BuzzFeed News reported in January that Trump directed Cohen to lie to Congress about when the Trump Tower Moscow negotiations ended in order to obscure his own involvement. Mueller’s office later issued a statement disputing unspecified elements of that report. BuzzFeed News stands by its story and the two law enforcement sources who informed it. 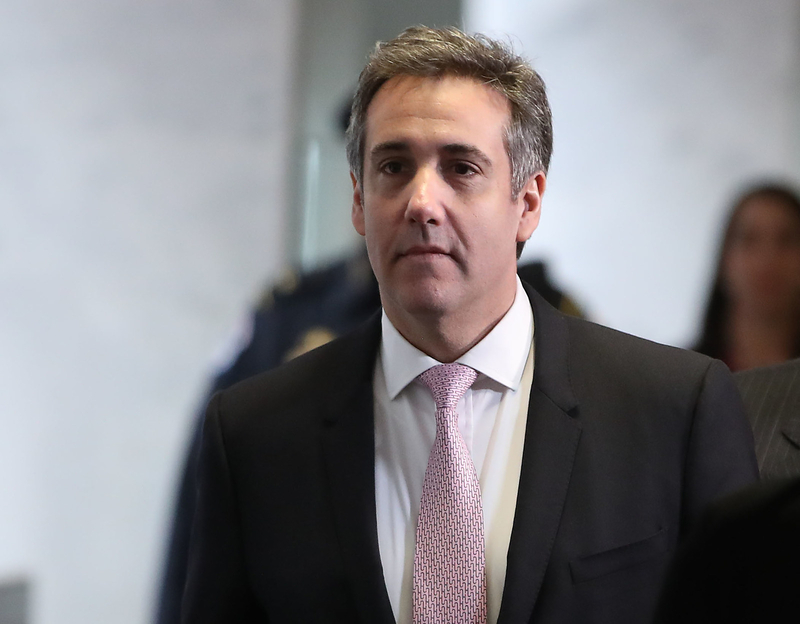 MIchael Cohen testified before the Senate Intelligence Committee Tuesday, the first of three days of congressional testimony on Capitol Hill this week. Lanny Davis, one of Cohen’s attorneys, called Gaetz’s tweet a “new low” in a statement. “We will not respond to Mr. Gaetz’s despicable lies and personal smears except to say we trust that his colleagues in the House, both Republicans and Democrats, will repudiate his words,” Davis said. Cohen is scheduled to testify before two more committees this week: On Wednesday, he’ll appear publicly before the House Oversight and Reform Committee, and is reportedly expected to accuse Trump of criminal conduct, racism, and more during that hearing. On Thursday, Cohen will appear privately before the House Intelligence Committee, which — like its Senate counterpart — is investigating Russian election meddling. Gaetz, though not a member of the Oversight Committee, had suggested on Tuesday that there would be “fireworks” related to his allegations against Cohen at the Wednesday hearing. “This is what it looks like to compete in the marketplace of ideas,” he said. A Gaetz spokesperson told BuzzFeed News Tuesday evening the congressman’s tweet spoke for itself. Democrats have already accused Trump of trying to intimidate Cohen before his testimony to Congress. Cohen canceled his first scheduled public appearance before the Oversight Committee because of what Davis described as “threats against [Cohen’s] family.” The cancellation followed a tweet from Trump accusing Cohen of lying to get a reduced sentence. “Watch father-in-law!” Trump added. Trump has also previously called Cohen a “rat” — a common mob term — for cooperating with Mueller’s probe. On Tuesday, a spokesperson for Pelosi referred BuzzFeed News to her previous tweet. “Looking into whether this is some violation of sorts,” the spokesperson added. In a tweeted statement Tuesday night, Pelosi said that all members should “be mindful that comments made on social media or in the press can adversely affect the ability of House Committees to obtain the truthful and complete information necessary to fulfill their duties” and that the House Ethics Committee, which can punish members of Congress, “should vigilantly monitor these types of statements.” She did not mention Gaetz by name. A spokesperson for Twitter, which can suspend accounts for threatening behavior, said its rules likely wouldn’t apply here because the tweet didn’t contain a violent threat. “I don’t know that we would consider it a threat given that there’s no threat of violence. If it’s tampering, it’s something for Congress and the courts to decide,” the spokesperson said. Cohen, who was sentenced to three years in prison in December for a range of federal charges, is set to report to prison May 9. Lissandra Villa, Ryan Mac, Nidhi Prakash, and Zoe Tillman contributed reporting to this story. This story was updated with Gaetz’s statement after he deleted the tweet late Tuesday night.